The Envirotrend PAKitToMe is a smartly designed, foldable backpack. Folds to a 12cm, 115gram sack easily attached to a belt or bag. Incredibly strong and lightweight at just over 100 grams, the backpack folds to a tiny 12cm square with handy clip for carrying when not in use. Features adjustable straps, 2 drink bottle holders, a pocket at the front and a keychain to safely attach your keys to the inside. 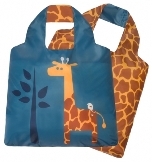 The Kids Collection of fun and practical tote bags. Eco-wise, compact and ideal for shopping, travelling, school or the beach.